Anne Teresa De Keersmaeker dancing to Brian Eno. That’s how Golden Hours was announced. 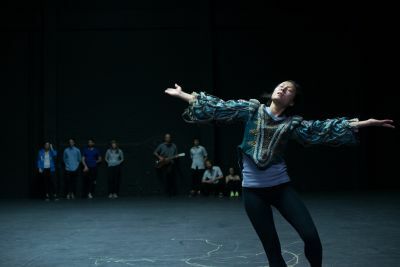 But somewhere along the way it became: Anne Teresa De Keersmaeker dancing to Shakespeare. Golden Hours (As you like it) still carries the traces of that shift. The piece once again proves the radical artistic mind of the Belgian choreographer, but at the time of the premiere (Kaaitheater, Brussels, January 2015), it was a dance performance that definitely needed some more thought. But just as I was wondering where De Keersmaeker would take Golden Hours from there, the music stopped and the mood of the performance changed drastically. Silence, for the remaining of the piece. Words by William Shakespeare appeared on the walls on the left and right hand side of the stage. And instead of that group of eleven dancers moving, just a couple of dancers. In twos, in threes, in fours, the rest of them watching them intently. Were they? Yes they were: dancing to Shakespeare, silently. Now and then I noticed someone whispering the words he or she was dancing to. But it seems as if De Keersmaeker came to the conclusion that Eno’s music proved to be not enough of a base, to build this piece on. And she brought Shakespeare in, as a means to further experiment with that guiding principle ‘my talking is my dancing’: dancing as if speaking. ‘Words express thoughts, ideas and images, so how do these thoughts motivate dancing? How can movement embody thought‘, as she explains in an interview in the program booklet. She opted for As you like it because the pastoral love comedy contains a number of topics linked to questions she’s been asking herself in recent years: the issue/perception of time, the play of genders and sexual identities, and a utopian motif which resonates with her environmentalist concerns. Anyone watching Golden Hours will tell you so, afterwards: it feels as an ill-fitting, contrived combination, Eno and Shakespeare. As you like it is really the fundament (the score) on which this performance is built, and that makes you wonder why Eno was the keyword in all the interviews and info before the premiere. Sure, once in a while he returns, shortly, as one of the dancers sings a fragment or so from another song of his album Another Green World, accompanied by Carlos Garbin, often walking around on stage with a guitar. But back to Shakespeare. What happens in Golden Hours is that throughout the piece the dancers are sort of following Shakespeare’s plot (without acting or mime). But not exactly. And they switch parts. Sure, their dancing is thoughtful, elegant and poetic. Almost every dancer gets his or her moment, and sometimes it’s weird to ‘feel’ how they succeed in embodying those lines. But after a certain point the performance starts to drag. It is as if you’ve seen what Golden Hours has to offer, but it goes on, nevertheless. I could almost feel it, the evening I watched the performance: after a wonderful duet by Sandra Ortega Bejarano and Georgia Vardarou, everyone in the audience was thinking that the piece had almost reached the end. But no: on the walls left and right the words Act Four appeared. And everybody sighed, and shifted in their seats. Golden Hours it as radical a performance as De Keersmaeker’s previous ones were, and it’s a daring step. But it feels as if she has got lost along the way, figuring a way out of this Eno & Shakespeare-mix and all the things she wanted to experiment with – ‘my talking is my dancing‘, ‘my breathing is my dancing’, the importance of ‘listening’, and the concept of the gaze as ‘a device of creating and mastering the space‘. It is really necessary to follow that story through, to the very end, for instance? Why not take some fragments? 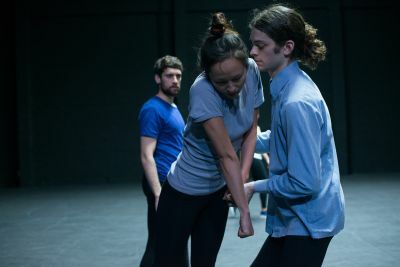 Due to its length and that continuous slow tempo, Golden Hours, feeling as a danced story of which you’re missing the point, fails to convey what it’s trying to say and come together as a great dance piece. More info & tour list here. A short You Tube clip here. New York Times review here. 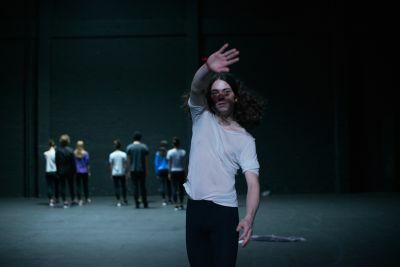 This entry was posted on February 16, 2015 at 11:36 and is filed under contemporary dance, dance with tags Brussels, critique, Kaaitheater, recensie, review. You can follow any responses to this entry through the RSS 2.0 feed. You can leave a response, or trackback from your own site.